These Terms will apply to any contract between us for the sale of Products to you from our US website (the “Contract”). Please read these Terms carefully and make sure that you understand them, before ordering any Products from our Site or any Made-to-order Products by e-mail. Please note that before placing an order you will be asked to agree to these Terms. If you refuse to accept these Terms, you will not be able to order any Products from our Site. We amend these Terms from time to time, and may, on occasion, revise these Terms as they apply to your order to reflect changes in relevant laws and regulatory requirements. Every time you order Products from us, please check these Terms, as the Terms in force at the time of your order will apply to the Contract between you and us. Our Site is operated by Edward Green and Company Limited ("we"). We are registered in England and Wales under company number 02926900 and have our registered office at Cliftonville Road, Northampton, Northamptonshire, England, NN1 5BU. Our main trading address is 75 Jermyn Street, London SW1Y 6NP. Our VAT number is GB 86 4442 316.
as the leathers we use for a number of our Products are natural products, the colour of these is built up through stages of tanning and hand-finishing, and so slight blemishes and differences in colour are common. Our shopping pages will guide you through the steps you need to take to place an order with us for our Standard Products. Our order process allows you to check and amend any errors at several stages before submitting your order to us. Please take the time to read and check your order at each page of the order process and use the ‘edit’ button to amend your order. clearly set out how you can confirm and submit this order by making payment. Please take the time to read and check your order before you make payment and contact your relevant Edward Green representative to amend any errors. For both Standard and Made-to-order Products, you may also at some point after ordering, which will depend on whether you have ordered Standard or Made-to-order Products and whether you have opted for delivery or collection from store, receive confirmation from our chosen courier that your goods have been dispatched. However, please note that neither of these communications means that your order has been accepted. in the case of Made-to-order Products, by sending you an e-mail confirming the details of your Order, including the price and description of the Products (the “Order Acceptance”). Confirmation, in this case, that the Products have been dispatched or are ready for collection will come after the Order Acceptance as the Products have to be hand/custom made. Please note that the Contract between us, in the case of either type of Product, will only be formed when we send you this Order Acceptance. We always strive to provide a flawless service, but if for some reason, we are unable to supply you with a Product, for example because that Product is not in stock or no longer available or because we cannot meet your requested delivery date or because of an error in the price on our Site, we will inform you of this by e-mail and we will not process your order. If you have already paid for the Products, we will refund you the full amount including any delivery costs charged as soon as possible. You can check and amend your order at various stages before the contract is made, see above. 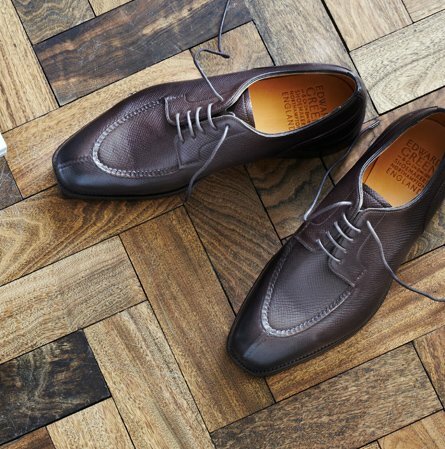 However, if you are unsure of the process and wish to make any changes to your order, please contact customercare@edwardgreen.com as soon as possible and, provided we haven’t dispatched your order, or in the case of Made-to-order Products begun production, we will work with you to make any requested changes. You have the right to cancel a Contract during the period set out below. This means that during the relevant period if you change your mind or decide for any other reason that you do not want to receive or keep a Product, you can notify us of your decision to cancel the Contract and receive a refund. Advice about the legal consumer right to cancel is available from your local Citizens' Advice Bureau or Trading Standards office. Please note that this cancellation right does not apply in the case of Made-to-order Products. where multiple Products contained in the same order are delivered on separate days, the last of the separate Products ordered is received. e-mailing us at customercare@edwardgreen.com or contacting us by post at 75 Jermyn Street, London, SW1Y6NP. If you are emailing us or writing to us we suggest you include the Model Cancellation Form at Appendix (1) so that it is clear who you are and the order of Products you wish to cancel, although this is not compulsory. arrange to hand it directly to our chosen courier by contacting Edward Green at customercare@edwardgreen.com who will give you a Returns Merchandise Authorisation (“RMA”) number and a time for our chosen courier to pick up the Products. You must return these Products to us in excellent condition and in the original packaging within 14 days after the day on which you let us know that you wish to cancel the Contract or after receiving your RMA number. We do not refund the cost of original postage. SagePay will refund you on the credit card or debit card used by you to pay. If you used vouchers to pay for the Product we may refund you in vouchers. We are under a legal duty to supply Products that conform with this Contract and you have legal rights in relation to Products that are faulty or not as described. These legal rights are not affected by your right of return and refund or anything else in these Terms. Advice about your legal rights is available from your local Citizens' Advice Bureau or Trading Standards office. If any Products we deliver are defective, faulty or not as described, please notify us within 6 months following your receipt of the Product and return the Product to us in the manner described above. We will examine the Product and if it is defective, faulty or was not as described, we will offer you a replacement Product, or if you are not satisfied with this, a refund of the price of the Products in full, together with any applicable delivery charges within 14 days of receipt of the Product. If the Product is found to be defective or faulty on receipt by us, we will refund you the cost of returning the Product, which will be payable within 14 days of receipt of the Product. Items that are damaged as a result of normal wear and tear are not considered to be faulty. If you accept the replacement Product, we will deliver to the address you supplied in your original order with us (unless specified otherwise), and pay for the delivery costs of getting this Product to you. From the US website we only deliver to the United States of America. For delivery to other regions please use our international site. If you purchase from our US site we will deliver your purchase duty paid into the United States, provided your order is for over $250. You will be responsible for paying any further local sales tax. For orders under $250 you will be responsible for paying any duties and taxes. Please note that we have no control over these charges and we cannot predict their amount. You must also comply with all applicable laws and regulations of the country for which the Products are destined, as we cannot be liable or responsible if you break any such law. You will receive confirmation both from our chosen courier, and from us, that your Products have been dispatched. These confirmations will contain a tracking number so that you can track the progress of your delivery with our chosen courier. Deliveries are made by our chosen courier between 8.30am – 6pm and are always by way of recorded delivery, which requires your signature for the Product/s to be delivered. If you are not available at your given address to sign for the delivery, our chosen courier will leave you a note that the Products are being held by them. Our chosen courier will contact you on the telephone number you provided with your order to re-arrange delivery and if they cannot get through to you on the third attempt, will contact us so we can make an attempt. If our attempt at contact is unsuccessful, the Products will be returned to us and you will have to contact us to re-arrange delivery or collection. Delivery of an Order shall be completed when you sign for the Products at the address you gave us and the Products will be your responsibility from that time. If you are concerned that your Products have been lost at some point in their journey to you, please contact customercare@edwardgreen.com within 7 working days of placing your order, so we can investigate. In the unlikely event your Products arrive in a damaged condition, or there is a discrepancy in the contents of any Products you have received, please contact customercare@edwardgreen.com within 2 working days of receiving your order so that we can investigate the issue and work with you to reach a solution. Provided an Order Acceptance has been received, orders placed before 4pm (London time) will be dispatched the same day with an estimated delivery date 1-3 working day after the date of the Order Acceptance to all US delivery destinations. The delivery date for Made-to-order Products will be agreed between you and us on a case by case basis depending on the specification of the Products and notified to you in writing. If you do not wish to cancel your order straight away, or do not have the right to do so under this contract, you can give us a new deadline for delivery, which must be reasonable, and you can cancel your Order if we do not meet the new deadline. The price of a Product does not include delivery charges. Our delivery charges are as advised to you during the check-out process for Standard Products or in e-mail correspondence for Made-to-order Products, before you confirm your order. To check relevant delivery charges, please refer to our Delivery Charges page. Our site contains a large number of Products. It is always possible that, despite our best efforts, some of the Products on our site may be incorrectly priced. If we discover an error in the price of the Products you have ordered we will contact you in writing to inform you of this error and we will give you the option of continuing to purchase the Product at the correct price or cancelling your order. We will not process your order until we have your instructions. If we are unable to contact you using the contact details you provided during the order process, we will treat the order as cancelled and notify you in writing. You can only pay for Standard Products using SagePay. Payment for the Products and all applicable delivery charges is in advance. SagePay will not charge your debit card or credit card until they dispatch your order. For Made-to-order Products you may also pay using a debit or credit card over the telephone. We accept the following cards: Visa, Mastercard, American Express, Delta, Electron, Maestro and JCB. Where you make payment with us using a debit or credit card over the telephone, payment for the Products and all applicable delivery charges may be in advance, or where we deem appropriate, in part. Nothing in these Website Terms of Supply excludes or limits our liability for death or personal injury arising from our negligence, or our fraud or fraudulent misrepresentation, or any other liability that cannot be excluded or limited by English law, including any breach of the terms implied by section 12 of the Sale of Goods Act 1979 (title and quiet possession, any breach of the terms implied by section 13 to 15 of the Sale of Goods Act 1979 (description, satisfactory quality, fitness for purpose and samples); and defective products under the Consumer Protection Act 1987. To the extent permitted by law, we exclude all conditions, warranties, representations or other terms which may apply to the Products, whether express or implied. You agree not to use any Products for any resale purposes. Any notice or other communication given by you to us, or by us to you, under or in connection with the Contract shall be in writing and shall be sent by pre-paid first class post or other next working day delivery service or e-mail. A notice or other communication shall be deemed to have been received: if sent by pre-paid first class post or other next working day delivery service, at 9.00 am on the second Business Day after posting or if sent by e-mail, one Business Day after transmission. These Website Terms of Supply, its subject matter and its formation, are governed by English law and shall be subject to the exclusive jurisdiction of the courts of England and Wales. Please download, complete, and return the Cancellation Form to us.